One of the most crucial stages that a baby will grow through is the teething stage. It can last for months or even years and can be a nuisance for your baby to go through. Whether you are researching the best teething toys for 4-month-old, 6 months, 12 months or older, you will likely discover different aspects of teethers that didn’t exist years ago. In this list of the 10 best baby teethers, you will be able to determine the right choice for your growing baby based on several attributes such as quality and overall customer satisfaction. When babies teethe, they attempt to put objects in their mouths to cure the pain. 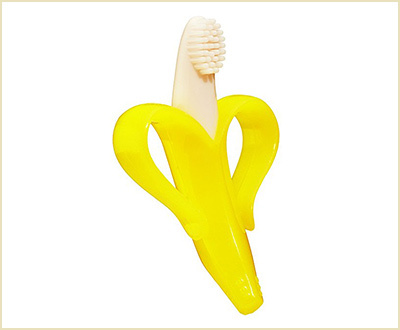 This is where a teether comes in place but with the baby banana infant training toothbrush and teether, your baby will not only get to teethe but also learn how to handle a toothbrush that lessens the chance of your baby developing cavities. The toothbrush is made of gentle bristles to avoid damaging developing teeth. It is BPA, latex, and phthalate free and is made of 100% food-grade silicone. The teether and toothbrush combo have easy to grip handles. It is recommended for ages 3-12 months which is the common months when teeth start to appear. • A safer alternative to traditional toothbrushes for babies/toddlers which contain hard plastic. • Helps promote good oral hygiene. • A variety of designs which include a banana and corn cob as well as various colors such as pink, yellow, blue and green. • Massaging bristles that remove food and milk particles. • No need to replace as teether is dishwasher friendly. • A possibility of bristles coming off if teether is chewed too hard. • This teether is beneficial for teething babies because it provides comfort and teaches babies oral hygiene from a young age. The Manhattan Toy Winkel Rattle and Sensory Teether Activity Toy contains a cube in the center of the teether to promote cause and effect learning while also making a rattle sound to keep your baby entertained. 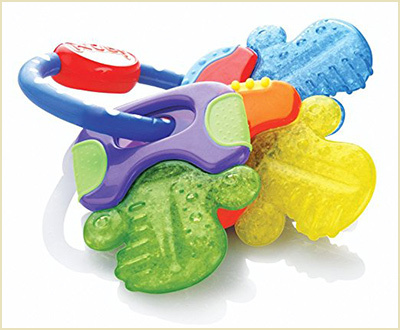 The teether makes the list as one of the best baby teethers due to its various benefits. It is enclosed in several different colored loops which make it eye catching and easy to grip while developing your baby’s gross motor skills. If your baby suffers from sore gums, the Manhattan Toy Winkel can be refrigerated in order to soothe any irritation. • Comes in several colors such as Colorburst Winkel, Zoo Winkel Owl, and Zoo Winkel Lion. • Rattle in center of teether is quiet which makes it convenient for use in any environment. • Loops are BPA free. 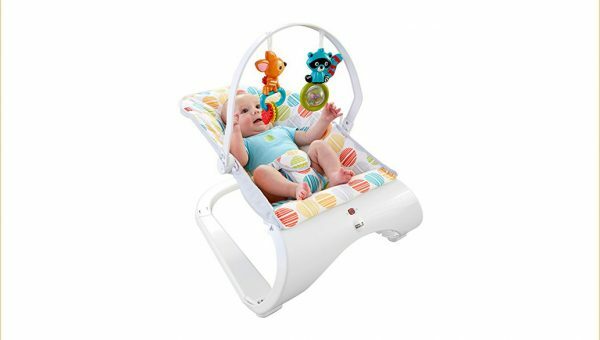 • Lightweight and easy for baby to grasp loops. 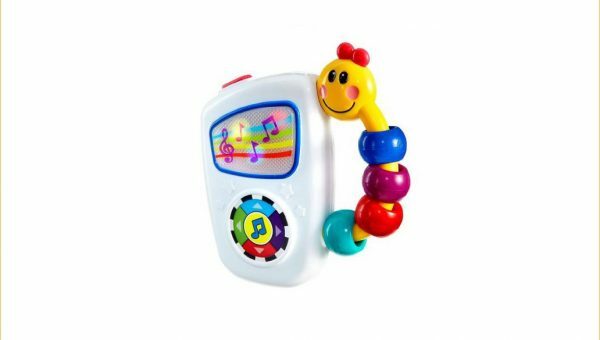 • Your baby is likely to stay entertained with this teether. 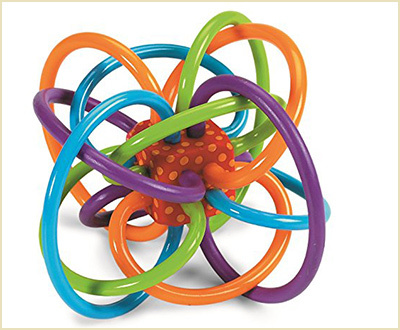 The different colored loops are appealing and will help develop your babies sensory skills. The Nuby Icybite Hard/Soft Teething Keys provides multiple teething surfaces for your developing baby. The textured surfaces provide massage and stimulation to sore gums as well as PurIce technology which provides cooling. This teether is one of the best teething toys for 4 months old or older. The hard and soft teething keys each takes turns in straightening and preparing for the growth of new teeth. Not only is the teether easy to grip but it also has various colors for each key which makes it stimulating and appealing. • Provides relief and assists in the eruption of teeth. • PurIce technology assures that teether stays cool for a longer amount of time than traditional teethers. • Keys are large which may cause difficulty inserting into the mouth. • The PurIce technology is beneficial for babies who are going through a rough teething phase. Since the coolness will last for a long period of time, your baby will experience less pain during the teething process. 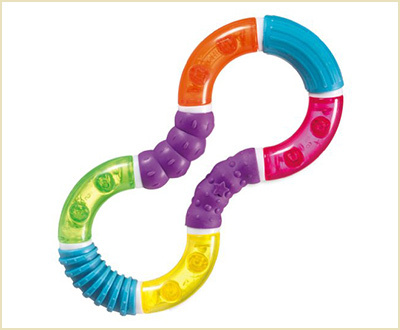 The Munchkin Twisty Figure 8 Teether holds true to its name as the teether twists into different shapes and promotes motor development and sensory skills. Recommended for babies 6 months+, the colorful aspect of the teether and rattle sounds makes it beneficial for soothing pain as well as a great option for baby teething toys since it provides entertainment as well. The four different teething surfaces make it easy for your baby to grasp, chew and hold the teether in order to provide relief for your baby’s incoming teeth. • Made of hard plastic which can cause difficulty chewing. • Not safe for the dishwasher. • With four teething surfaces, your baby will be able to experience different textures as well as soothe irritation caused by teething. When searching for baby teething toys, safety comes first. The Safety 1st featuring Mombella Ellie Elephant Teether is made of soft silicone that protects your baby’s delicate growing teeth. The bright colors help stimulate baby’s eyesight which makes it stronger while the texture stimulates sensory skills. The elephant shape of the teether makes it easy to grip and resembles a pacifier which encourages your baby to use it often. • Dishwasher and freezer safe. • Aids in different stages of teething. • The design is big which makes it difficult to insert into the back part of gums. • It is beneficial that this teether enhances a babies eyesight. The fact that sensory skills are also strengthened due to the texture makes this an excellent choice. The Nuby Silicone Teethe-eez Teether with Bristles is made with a fish-shaped designed and oceanic colors that is designed to stimulate your baby’s erupting teeth. The center of the teether holds 100% silicone bristles which stimulate the lips and tongue and provides cleanliness and relief to achy gums. • Comes in a variety of colors. • Suitable for newborns and up. • Gathers dirt and hair easily. • This teether looks simple but has many benefits. If your baby enjoys animals, this teether may be a great option since it would encourage your baby to use it when in pain. The RaZbaby RaZ-Berry Silicone Teether looks like a pacifier but is built with teething in mind which is important if you are searching for the best teething toys but your baby is still dependent on their pacifier. It contains berry bumps which relaxes and soothes gums and best of all, this teether is completely hands-free and takes the place of a traditional pacifier due to it’s increased benefits for teething babies. Best of all it can be frozen in order to provide increased comfort. • 100% soft food grade silicone. • Although recommended for babies who are 3 months+, the teether may be too big until at least 5 months. • This is beneficial for babies who love to use their pacifier. This product can take the place of a pacifier and has added benefits that make teething a smooth process and one of the best teething toys to support your baby during this phase. 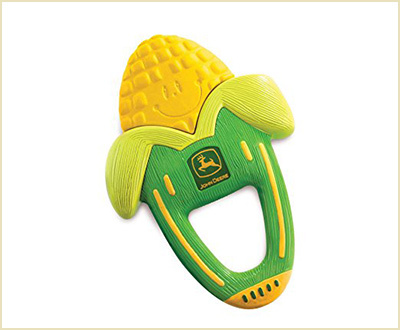 Recommended for ages 6 months and up, the First Years John Deere Massaging Corn Teether makes the list as one of the best teething toys because it is a unique product that features gentle vibrations and soothes aching gums. The vibrations can be turned by the parent or baby simply by pressing on the teether which also helps the baby learn cause and effect. • This teether makes the list as one of the best teething toys due to the vibration effect which provides a unique aspect to your babies teething process. 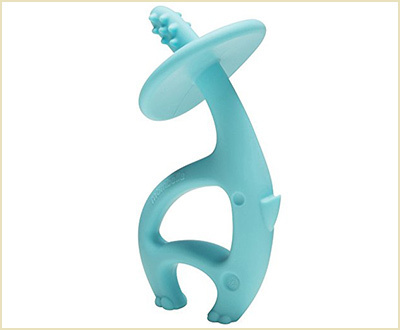 If your baby needs an extra boost for pain relief, the vibrating teether would help speed up the process of pain relief. 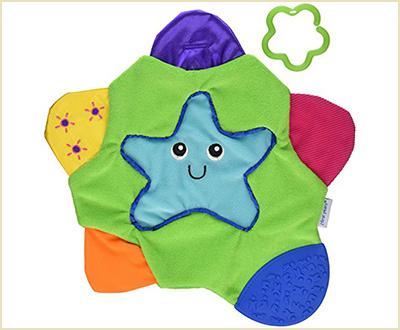 The First Years Star Teething Blanket is made up of soft, satin and silky textures. It is lightweight, easy to grasp and the multiple textures make it a comforting experience for teething babies and a beneficial option as one of the best teething toys for your baby. 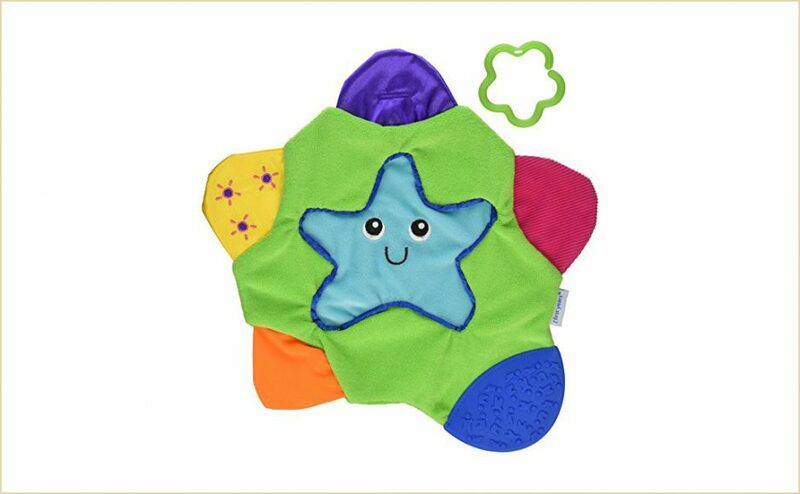 The teething blanket also has different sound effects such as “squeaking” and “crinkling” when the baby touches different areas which make it suitable as a teether, blanket, and entertainer for your baby. • Toys on a blanket that make various sounds. • Helps develop motor skills. • Different textures for baby to teethe. • Babies may not be interested in the blanket as a teether. • It is rare to find a blanket that also offers teething benefits. If your baby is interested in this teething blanket, they will be able to cure their teething pain with the different textures included. As one of the best teething toys, this multifunctional teether can be used simply as a blanket or as a teething device if your baby wakes up during the night. The Mombella elephant teether by Safety 1st is made of 100% BPA-free silicone and is dishwasher-safe and freezer-safe. The smooth texture of the silicone encourages the baby to touch and explore the toy while the nubs provide a good surface to stick teeth into. It comes in two bright colors: light blue and intense yellow which further attracts the baby. In addition, this teething toy is easy to grasp by babies and easy to clean. • Keeps the baby happy and smiling even during the worst teething days. • Easy to hold and maneuver by babies even before motor control functions properly kick in. • The nubs are a bit short for some babies with growing molars. • Although it doesn’t look like much, this is the best teething toy you can purchase this year according to online reviews and ratings. In summary, the best teething toys for babies listed above each offer tremendous benefits to help your baby feel comfortable during the teething process. Depending on your babies needs, you are bound to find a teether that satisfies your baby and helps make the teething process less painful.